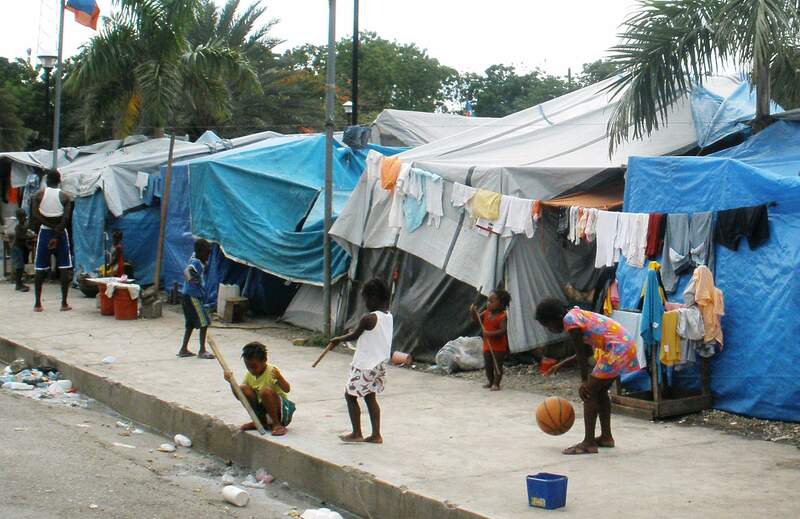 Tent cities like this one sprung up across Port-au-Prince after the earthquake. Many have yet to be replaced by permanent homes. In a letter to friends and supporters Wednesday, Gersan Valcin, pastor of Eglise de la Communante Evangelique dHaiti in Port-au-Prince, recognized the many still without homes. We remember the many dead today, but we know that life is about the living. We pray for a greater solidarity for those that are still under the tents and for the country as its recovering from cholera, he wrote. 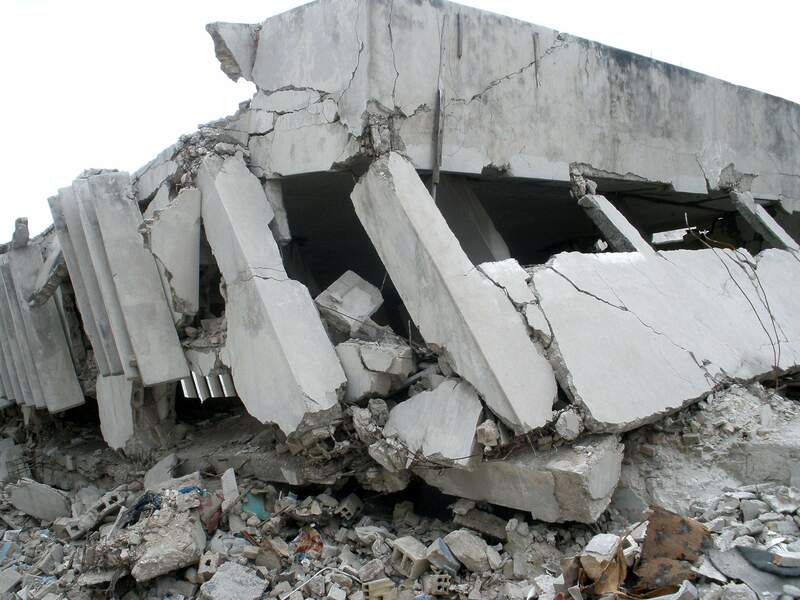 A building in Port-au-Prince that crumbled when the earthquakes tremors shook the city looks identical to hundreds of others across the city. Even months after the earthquake, corpses remained trapped in many of the collapsed buildings around the country, Don Ricedorff said. For many families, it was impossible to get closure with loved ones because their bodies never were recovered, he said. 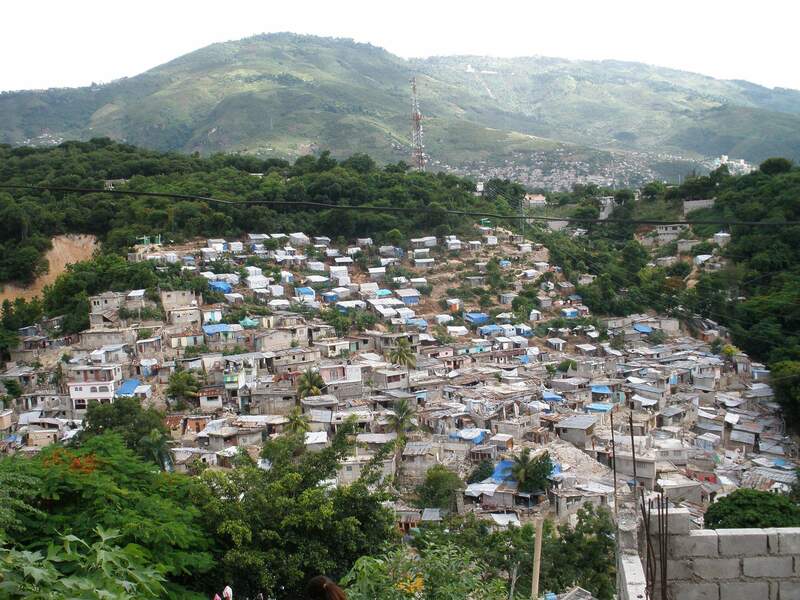 The view looking down on Port-au-Prince from one of the hills above the city. It all started with $100. During Sunday service at First Baptist Church almost a month after the earthquake in Haiti, Don Ricedorff volunteered to take the money from Jeff Dobesh, the churchs pastor. Ricedorff was to use the money to do some sort of good in the world outside the churchs walls. Neither of the men knew at the time that Ricedorffs seed money would multiply hundreds of times over. Similar outpourings of support for Haiti have occurred at other local churches. People touched by the tragedy opened their wallets, gave of their time and some even journeyed to the quake-ravaged country. These are the stories of their efforts. Ricedorff, after reading an article about the strain that Haitian churches were experiencing after the earthquake, decided donations would be funneled toward one church, Eglise de la Communante Evangelique dHaiti in Port-au-Prince. One of the few that survived the earthquake intact, the church immediately organized food and water distribution efforts, followed by a medical clinic and then house-building projects for the surrounding community. In Durango, Ricedorff contacted everyone he could think of  friends, family, business contacts, fellow church members  to ask for donations. He used his own money to buy water bottles that he handed out, asking people to bring them back when they were full with spare change. Durango Joes and Doughworks took up the cause, as well, selling the water bottles and free coffee or doughnuts for $10, all of which would go to Haiti. Ricedorffs single criteria for the fundraising was that 100 percent of the donations would end up at the church in Haiti. At the end of the project, he raised more than $30,000. The majority of the money went to build 20 houses that the church was working on. A smaller part went toward buying a truck that the church used to distribute food. In June, Ricedorff traveled to Haiti, a trip he felt he had to make to be sure the money had accomplished what it was meant to do. He visited the church and met some of the beneficiaries of the housing project. One was a woman who was pregnant when the earthquake happened and lived for weeks on the street after the event. When he met her, she was with her new baby. In the months since his trip, Ricedorff said he has kept in contact with Gersan Valcin, the pastor of the church, and still sends money to him and his family. The last update he received from the pastor and his wife was written on New Years Eve. St. Marks Episcopal Church, in the weeks after the earthquake, became a leader in Durangos fundraising efforts, and over the year, it kept collecting. It also organized a silent auction and soup soirée in February. In total, the church has raised more than $45,000 for organizations working in Haiti after the earthquake, the Rev. Andrew Cooley said. The church has never put this great of a focus on one cause, he said, but this one has touched him more than any other. St. Marks chose its beneficiary organizations in Haiti based on connections it had within its congregation, he said. Each organization received a little more than $10,000 each from St. Marks, he said. The church chose to donate to Episcopal Relief and Development because its bishop is on the organizations board of directors and chose the Colorado Haiti Project because Cooley had visited its work site four years ago. It donated to Hôpital Albert Schweitzer and Compassion International because members in the congregation are working with those organizations. Cooley said he has no doubt that the churchs money is going to a good cause because he regularly gets firsthand or secondhand updates about each organizations work. The hospital, for example, was on the front lines of the cholera epidemic and continues to accept and treat patients infected with the disease on a daily basis. One lesson Durangoan Gary Russell learned while on a relief mission in Haiti is the only way to help is one person at a time. Russell, who went to Haiti with the United Methodist Committee on Relief in May, has gone on mission trips across America, including to Pine Ridge, S.D., the second-poorest county in the nation. He had never seen anything like the poverty in Haiti. Russell, together with Hesperus resident Karen Preston, was on a 10-person team led by the Rev. Jon Laughlin from Wyoming. Their job was to build a 10-foot security wall topped by razor wire around an orphanage in Port-au-Prince. All the Haitians know that the nongovernmental agencies are making sure theres food at the orphanages, he said. This made them vulnerable to theft from the desperate population, many of them parents trying to feed starving children. The team took money and medical supplies with them, much of it donated by First United Methodist Church of Durango. Robb Bourdon, the churchs business manager, said the church raised more than $20,000 for United Methodists relief committee, which itself raised more than $47 million. Some of that money was used to buy the materials and hire Haitians to do the actual building of the wall. Durangoan Jerry Hanes has been to Haiti twice with the relief committee, and Preston is planning another trip next month. She is looking for people with medical experience whod like to join her team. One potential project the team may work on is water filtration systems. Preston said theyre currently made and used in the neighboring Dominican Republic, where parents report fewer intestinal diseases in their children. The systems are made from charcoal, sand and used food-grade plastic buckets and cost about $20 a year. Again, the mission team hopes to hire Haitians to build the systems.